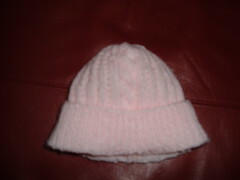 Somehow during the course of today, I have managed to do a load of housework, cook dinner, walk to the supermarket and back (at least 45 mins each way) and still complete the tiny baby hat I was knitting to go with the tiny cardigan. If I have time, after making a bear, I’ll make a magic bunny to go with them as a gift from me. 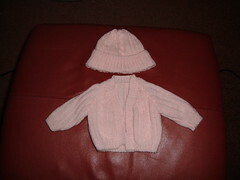 The yarn for the cardi and hat is Snuggly 4ply from Sirdar, and it’s amazingly soft. It was a close run thing though as I had just one 50g ball to work with and I ended up with less than 6 inches of it left! The walk to Sainsbury’s was nice, as we took the scenic route through the River Ray Parkway and even detoured down the bridle path for a short way. We were glad we did, as we heard and then saw a buzzard ‘pew’-ing and soaring over the treetops before diving down out of sight. They make such a delicate noise for such a big bird of prey. Then we spotted a cormorant flying over head, circling round and eventually meeting up with a second cormorant. The two of them continued circling, really close together and occasionally even touching. I don’t have a clue what they were doing, but it was still interesting to watch. It turned out though, that I’m not as well healed as I thought…I’ve had pain running from the surgery scars right through to the old pain sites ever since the walk home. Oh well, I guess it just takes time. This entry was posted on September 26, 2009 at 11:00 pm and is filed under Baby, Health, knitting, Wildlife. You can follow any responses to this entry through the RSS 2.0 feed. You can leave a response, or trackback from your own site.